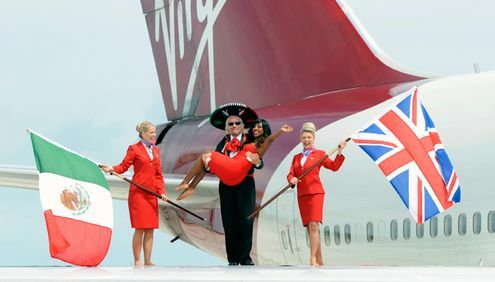 It was literally stars on Earth as Sir Richard Branson, UK X Factor winner Alexandra Burke, Celebrity Juice host, Keith Lemon and an aircraft filled with VIP’s landed in Cancun to celebrate Virgin Atlantic’s new service between London Gatwick and Cancun. Dressed in traditional Mexican attire, Sir Richard Branson was welcomed by a Mariachi band. The VIP guests list included Sir Richard’s family, Derren Brown, Cleo Rocos and other travel industry guests. They had a well spent holiday by staying at the five-star Royal Hideaway resort on the Riviera Maya and exploring the sights and sounds of Tulum, Chichen Itza, and Xplor. The highlight of the trip was the swimming with whale sharks. On the launch, the President of Virgin Atlantic Airways, Sir Richard Branson said that he is delighted to be in Cancun to celebrate Virgin Atlantic’s new route. Mexico holds a special place in his heart and it is great to be celebrating the special occasion with all of his family and friends. Cancun is one of the top five long-haul leisure destinations for UK travellers, and he believes that he can drive the demand even higher by providing great competition to the rivals with their award winning innovative product and service. Amanda Wills, Managing Director of Virgin Holidays added that customers have been asking for this direct service, and it’s great to finally see it happen. They are already witnessing growth in demand for Cancun and Mexico with a near 800% year-on-year increase for 2012 and they are looking forward to growing that further and establishing a significant market share in the future. They have expanded their program in Caribbean which now features 32 properties and exclusive tours which will reinforce their position as the number one in the region. With superb beaches, great hotels and cultural sites, tourism to Cancun and the Riviera Maya is thriving. A blend of heritage, opportunities for relaxation and stunning hotel, this region offers excellent value for money and hence remains on the top of every holidaymaker’s list. With ease of air travel and increased connectivity, tourism as well Riviera Maya real estate are set to receive a boost in the coming years. Virgin Atlantic will fly twice weekly from London Gatwick to Cancun. For more information, log on to www.virginatlantic.com or call 0844 2092 770.